You're looking for unique style websets? 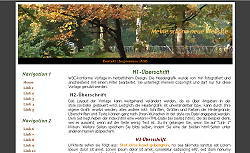 Modern W3C-compliant website template in autumn design. Only one graphical element has been used (the header). All other colours, fonts, sizes can be adjusted to your personal taste. An alternative template with a slightly different header is also included. Template without tables and without frames: pure CSS! The colour gradient is also done by CSS3. All newer browsers should be able to show it. The only graphical element used is the image right top, which can be replaced by your own image. The total width of the template is 990 px but can be adjusted in the style.css by skilled users. Same template like 05_1 in different colours.